LiveMD recognizes the fact that clean, safe drinking water is one of the most important factors to good health and a lack of it is one of the leading causes of sickness and death in developing countries. Today we look at the importance of potable water and discuss the health issues that arise due to drinking from contaminated sources. Why is Clean Drinking Water so Important? 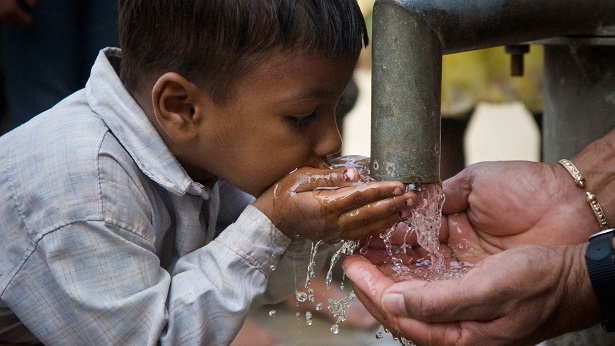 There are close to 900 million people across the globe that do not have easily accessible, clean drinking water. These people are are being exposed to chemicals, bacteria, and parasites by drinking contaminated water which is leading to dehydration, diseases and death. 65% of the human body is made up of water. It is a necessity for life in order to flush toxins out of our body and assists in the digestion of food. Without consuming water, a person can live for only 3 days. How Does this Issue Affect Women? The lack of clean drinking water is a major issue for women and young girls. The majority of the people that are affected by this problem live in rural areas and must travel many miles, by foot, in order to obtain safe water. Heavy buckets of water must then be carried back to their homes. This task is usually assigned to the women of the communities meaning that young girls do not have time for schooling and education and older women do not have the time to find proper employment to assist in supporting their families. What Diseases are Caused by Contaminated Water Sources? Arsenicosis and Fluorosis – High levels of arsenic and fluoride in water supplies are extremely common and can be very toxic. Long-term exposure to these chemicals can cause severe health complications such as painful lesions on the skin, bone disease and certain cancers. Diarrhoea – Diarrhoea is caused by ingesting bacteria through unsafe water supplies. The soft and runny stools that it causes can cause severe dehydration and accounts for 4,000 deaths every day around the world. The people most affected are those under the age of 5. Cholera – This is an infection that occurs, due to the ingestion of bacteria, in the intestinal tract. It causes very severe diarrhoea that can quickly lead to dehydration and death. Guinea Worm Disease – Also known as Dracunculiasis, this disease is contracted from drinking water that is contaminated with the dracunculus larvae. This larvae enters the body and begins to mature. It can grow to measure up to 3 feet in length. When the worm is ready to exit the body and lay eggs of its own, it begins to burrow out through the skin leaving large sores and ulcers which are painful and can become infected. The best method of prevention for this disease is by always drinking through a specialized, filtered straw. Intestinal Worms – Intestinal worms are another common problem that are ingested through contaminated water. These parasitic worms live in the intestines and cause stunted growth in children, anemia and malnutrition. Schistosomiasis – This disease, also known as bilharzia, is caused by a parasite that lives in water. A person who bathes or washes their clothes in the infected water or ingests this water can contract this disease. After contraction, damage can occur to the liver, lungs, bladder and intestines. Trachoma – Often because of a lack of clean, fresh water, people suffer from poor sanitation and hygiene. Trachoma is a disease that is common in those lacking good hygiene practices and is characterized by blindness. Over 6 million people in the world today are blind because of this disease. Access to safe water sources can prevent this disease. Typhoid – Characterized by headaches, nausea and a loss of appetite, Typhoid fever occurs when water sources become contaminated with this disease and are then ingested. Over 12 million people suffer from this disease each year. LiveMD is aware of the dangers of living without access to clean water supplies. Our doctors are here to provide you with advice on how to minimize your risk of contracting diseases associated with contaminated water and can provide the best possible treatment options for those who have already fallen ill. Visit www.mylivemd.com and book your appointment today and talk to a doctor by phone, video, or text.